The Dolphin Lovers’ Swim tour is an excellent way to make your Grand Cayman experience one you’ll never forget. This tour offers guests the chance to kiss and shake hands with one of our beloved dolphins. Your friends and family will also get the opportunity to learn about hand targets. Don’t miss the opportunity to have a personal experience with some of the most intelligent marine animals. Kids must swim with a paying adult. Experience the activity of a lifetime in the calm, warm waters of the Grand Cayman. The Dolphin Lovers’ Swim program is great for people of all ages and is in a safe and friendly environment by the shores of the Grand Cayman, a beautiful and sunny paradise. The program features dedicated educational time with experienced instructors to learn about the dolphins’ eating habits, behaviors, anatomy and other interesting facts. During your tour you’ll enjoy the dolphin’s natural habitat in a shallow reef-protected lagoon, learn about their biology and life cycle, and understand how they use echolocation to find each other and food. Enter the Dolphin Cove to meet with an experienced and friendly trainer. In this peaceful lagoon, you’ll see and learn about the dolphin’s natural environment while your instructor provides insight on how to best interact with these beautiful creatures. This interactive session takes place on a three-foot submerged platform. 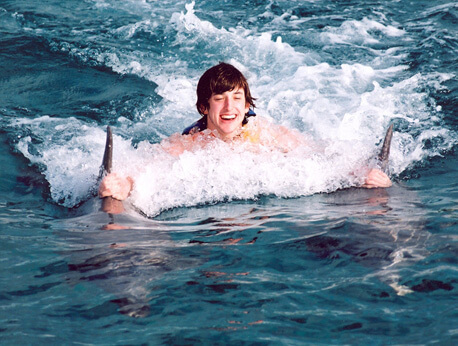 Swimming, playing, and jumping in the water with dolphins are just some of the activities you’ll experience throughout the duration of this tour. You’ll also be able to participate in the hand target activity. This activity consists of dolphins responding your commands and touching their snout to your hand on cue. Additionally, you’ll enjoy kissing and shaking hands with your new dolphin companions. Share this fun and exciting experience with your loved ones while making new friends with a few dolphins! Come away with new knowledge about these gentle creatures and their habitat. Your up-close time with these amazing mammals will shed light on new facts about dolphins. Our unique combination of excitement and education generate memories that you and your family can hold onto for years to come. There are other Dolphin Discovery activities to enjoy after this Dolphin Lovers’ Swim program. So be sure to see what other treasures the Grand Cayman has in store for you! Adults are 4'7" and above and kids are 3'11"-4'7". IMPORTANT: a valid passport is an essential requirement to visit Grand Cayman in the Cayman Islands. Kids who measure 2’11” to 3’11” must swim with an adult (Free). In Grand Cayman, groups have a maximum of 20 people for a closer experience. For safety reasons pregnant women (5 months and later) can't participate in any of our aquatic programs. Women with less than 5 months into their pregnancy can participate in the Encounter program only if accompanied by another adult and after signing a Responsibility Form.